School can be very stressful for kids! After spending all day in chairs being told what to do, getting outdoors – in nature – is my favorite way to help my kids decompress. In Massachusetts it was sometimes too cold for these activities (raining or too cold). The weather is nearly always fine in California, but sometimes I have to get home (where we do not have much space to play outside) to do chores or for Anna to take a nap or start dinner. Sometimes we have doctor’s appointments, which my kids find at last as stressful as school! I am sure I am not the only parent with this problem, so today I am sharing some of my favorite calm activities that help kids decompress after school. Note: Some of the links here are affiliate links; purchases made through these links may earn me a small commission at no cost to you. Thank you for supporting my site! 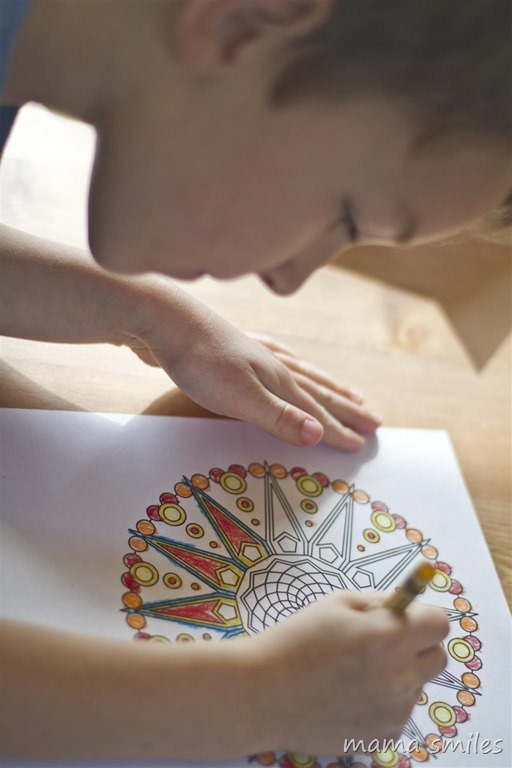 Detailed coloring pages. There are a lot of these that you can download for free online – Print Mandala is our personal favorite site. If you want a physical coloring book, this Flower Designs Coloring Book and this Nature Mandalas Coloring Book both look good, and received excellent reviews on Amazon. Sticker books. This Mosaic sticker book is our family’s favorite. Listening to Classical instrumental music. If you happen to have Amazon Prime, I recommend their Classical for Reading playlist as a starting point. My kids like Bach’s Cello Suites, Chopin’s preludes and nocturnes, Bach’s Goldberg Variations (Bach’s Well-Tempered Clavier is also nice), and the Spring movement of Vivaldi’s Four Seasons. Sensory activities. Play dough and sand trays rank high on our list, and I am tempted to invest in Thinking Putty, which is essentially really pretty silly putty! Looking at family photos. We put ours into photo books (I am way behind and need to catch up), and my kids really enjoy looking through them. Looking at old photos is a great way to remind kids of things they love, and it can help them learn more about their family history and culture. Household chores. Once these are clearly defined and kids are willing to do them without fussing, household chores can be a very calming part of their day! Contributing to the family can be a very rewarding feeling! Extreme Dot to Dots. These are particularly useful when you need kids to be quiet. Each dot to dot takes my kids at least an hour. I copy the pages using my printer and they all work on the same dot to dot together. Thanks to this book, even kindergarten-aged Lily knows her numbers well into the hundreds! You may be surprised that reading is not on my list. Anyone who has seen my home library will tell you that I love books, and particularly children’s literature, and reading is an activity all of my kids engage in at some point in the day. But reading is a distracting soothing technique. For kids to process their days, they need time where they can think. All of the activities above are simple enough that kids can think through things in their head while they do them. What are your favorite calm activities for kids? Much to my dismay my kids never really got into the intricate coloring sheets. But they do like their silly putty and play dough. Classical music and really pretty silly putty…can I come over? This is a great list of calming activities! I will try them all. Come to think of it, you’re right—my kids don’t read right after school. I never thought of it or wondered why, but I think it’s true that they really don’t want to concentrate right at that moment. They probably want to just do repetitive or calming activities. They like to do sand trays, painting and art. Those are three great calming activities for after school! I LOVE your point about reading being distracting rather than processing time!! I need to employ that observation in my own life. And that colouring-in Johnny is doing is beautiful! Johnny really enjoys this type of detailed work. Miss Enigma likes the Sticker Dolly Series from Usborne. That is great to hear – I just ordered one of those for Lily! My daughters love the “Zen colouring” books, as we call them. And, I had never seen the Extreme Dot to Dots before (we live overseas) and just ordered two of those books. Thanks for that suggestion. They look awesome! I hope your daughters enjoy them as much as my kids have! We have a hard time between school (well, day care pick-up) and dinner at our house with both kids. We love looking at family photos and videos on the computer. I’ve even video called my parents who have entertained my kids while I prepped dinner. I’d hardly call the gma hype calming, but it helps me, which keeps me cool. I love the idea of video calling grandparents to get through a hard time! My son needs to run hard after school. I try to give him time to run at the school playground with his friends. Even 15 minutes helps him a lot with decompressing after school. We try to do this in most weather too except extreme cold or torrential rain. Running is a wonderful way to decompress – so healthy! These are great! My kids started a new school this year so we’re still trying to find a new rhythm. One of their favorite things to do after school is to ride their bike around for a bit. New schools always take a while to adjust to. Johnny loves to ride his bike – the girls we are working on!